The Magician battles for Jamaica! Ian Wilkinson, "The Magician battles for Jamaica," Jamaica Chess Federation, 12 November 2006 (Kingston, Jamaica). 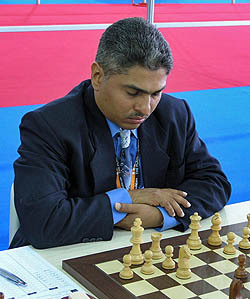 Jamaica's legendary record seven-time national chess champion National Master Shane "The Magician" Matthews journeyed from Jamaica to Venezuela on Saturday 11th November, 2006 to do compete in the 2006 Sub-Zonals Chess Tournament scheduled to take place between November 12 and 19, 2006. The event, a nine-round Swiss, is set to be held in the Aguas Termales Hotel located in San Juan de los Moros a city about 45 minutes travel from Valencia and approximately 3 hours from Caracas, the capital. This tournament is likely to be very competitive as players hunt international titles and norms. Barbados' freshly-minted 2006 national champion Terry Farley will also participate.